The East Haddam Historical Society, founded over 50 years ago, has been at this Town Street location for 11 years; it's just around the corner from Gillette Castle, right on the Route 82 corridor. The museum has a fine collection of local and Lower Connecticut River Valley historical objects, and prides itself on its kid-friendliness. Among the highlights of the museum are a photographic display of the rise and fall of the Industrial Age in Moodus Village, Native American artifacts dating to 1300 B.C., a photographic exhibit of the building of the East Haddam swing bridge, and a collection of changing fashions with period costumes on display. The museum is open Memorial Day weekend to Columbus Day weekend, Saturdays and Sundays noon - 4pm and by appointment at any time. Tickets are $5 per adult; children under 12 free. The East Haddam Cub Scouts Pack 22, Wolf Den 3 visited the East Haddam Historical Society & Museum recently to learn more about our town. They were very interested in the Twine Mills exhibit freight scale and fish net loom, the Klaxon siren used at Goodspeed Landing, 1913 photos of building the East Haddam Bridge, and the Twentieth Century Moodus Architectural Model of proposed road changes and new buildings. The Cubs made bridge models of their own after their tour. Their visit and discussion helped them accomplish the Cub Scouts' goal to learn more about their town. Museum staff, parents, and Cubs enjoyed the evening tour. The Cubs plan to come back with their families to teach others about what they learned. The Community Foundation of Middlesex County recently awarded a grant in the amount of $2,000 to the East Haddam Historical Society for the purchase of a projection system. The Society will apply this grant toward the purchase of audio equipment that will greatly enhance the sound quality of the presentations that are a feature of the Society’s annual public program. The grant is funded in part by the Community Foundation of Middlesex County/Ann T. D’Addario Family Foundation Fund, Kalayjian Family Fund, and the Herb and Ellen Patterson Memorial Fund. Community Foundation of Middlesex County is a nonprofit organization dedicated to improving the quality of life in Middlesex County. Its mission is to work with charitably-minded individuals and organizations to build permanent endowments and other charitable funds and to support local non-profit organizations through effective grant making to address community needs. Since its founding in 1997, the Community Foundation has provided 2,068 grants totaling more than $6million to nonprofit organizations for the arts; cultural and heritage programs; educational activities; environmental improvements; and for health and human services. See the East Haddam Swing Bridge documentary that Kristie Kaminski, Valley Shore Community Television, published in October 2018. Historic photos; community members talk about our wonderful bridge! 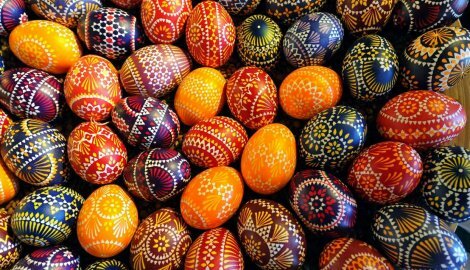 Learn how to make beautifully decorated Ukrainian eggs. Pysanky is an art form celebrated all over Eastern Europe at this time of year. Artist Sharon Leonard will guide you through the process of planning a design, dyeing and waxing multiple times, and polishing the wax-resist jewel-like egg. Stylus, wax candles, colored dyes, and eggs will all be provided for you. East Haddam Historical Society & Museum has hosted this workshop twice before. Because of the popularity of the workshop over the years, we will have two sessions on April 7, one from 10-12 and the other from 1-3 pm. For those of you who have attended, we'd love to see you make another amazing creation. For those who have never been, please join us for a workshop that will give you the ability to make these every year. Your creations will, of course, go home with you. Please pre-register early. Call 860-852-5722. Workshop spaces are limited. All profits will help EHHS. All events will take place at the Museum unless otherwise stated. Events are open to the public and free to members and children under twelve, except as noted. Donations from non-members is $5 for regular events. One-man drama by Kandie Carle about the life of Yukitaka Osaki. Osaki played by Taku Hirai. $20 per car. Free to shop. Bring goods to sell. RSVP Judi Glover 860-434-2603. Plus ~ the Annual East Haddam Garden Club Plant Sale! Jerry Roberts presents The CT River From the Air! A personal perspective on New England's historic river. Cliff Bragdon will be giving a presentation on his uncle, W. Langdon Kihn. Kihn traveled for 15 years for National Geographic, painting Native American tribes in many western states. The Kihn family has long been involved with the East Haddam Historical Society. Local expert, Nancy Ballek Mackinnon, on historic gardens! Amanda Goodheart Parks will be presenting a lecture on The Real Story of Rosie the Riveter ~ her journey from propaganda poster to feminist icon ~ and uncovering the history of the real-life Rosie! Appraisal Night ~ East Haddam's Antiques Road Show! Bring three antiques to be appraised at $5 each. Admission fee $10 at the door. Karl Stofko's annual presentation of weird and wonderful historic events in East Haddam! Bring a dish to share! Music by Russell Shaddox and Friends! Beer and wine donation bar! CELEBRATE!